One thing isn’t clear about this story, and that’s whether the dog is old, and the trick is new, or vice versa. Another thing isn’t clear – and that’s whether there are any dogs at all in this story, from the point of view of a public prosecutor. The tale concerns a piece of Moscow real estate which once belonged to the great state of Hungary, and which, despite its notorious, ancient and current hostility towards the great state of Russia, sold the asset to the federal government for the Ministry of Regional Development — at a price far below what the most implacable Russian-hating Hungarian would consider to be fair value. The Hungarians received Rb511 million ($21.3 million) for their asset, a building in the elite Krasnya Presnya quarter, which served as their trade mission during the last decade of the Soviet period and the first decade of the Russian one. The sale by the Hungarians took place in March of 2008. Between December 2008 and June of 2009, the Regional Development Ministry signed purchase contracts for the building, paying Rb3.5 billion ($111 million). The money came from a state budget allocation to the ministry. In between the purchase and the resale, a short-lived Luxemburg-registered company owned by Victor Vekselberg’s Renova holding, through another short-lived Russian registered subsidiary, did the buying and the re-selling. Naturally, it didn’t keep all of the fivefold increment in value, or $89.7 million of the proceeds. On February 9 of this year, three Hungarian officials were arrested in Budapest on suspicion that some of the difference between real value and realized value may have stuck to their fingers. They are a former Hungarian Ambassador to Moscow, Arpad Szoke; a former Secretary of Foreign Ministry of Hungary, Feksi Khorvat; and a former Secretary of State Property Management, Miklosh Tartay. In April, former Hungarian Prime Minister Gordon Bajnai was formally questioned by the Budapest fraud squad and state prosecutor about the deal. Victor Vekselberg – far from old at age 54 – appears at the start of the transaction sequence, when his presence was recorded at a meeting of Russian officials in November 2007, where there was a discussion of what a good idea it would be for the Regional Development Ministry, then headed by Dmitry Kozak, to move into the building after the Hungarians had moved out. Deputy Prime Minister Alexander Zhukov presided at that meeting, and later signed the government orders required for the Hungarians to sell, and for the federal government to buy. 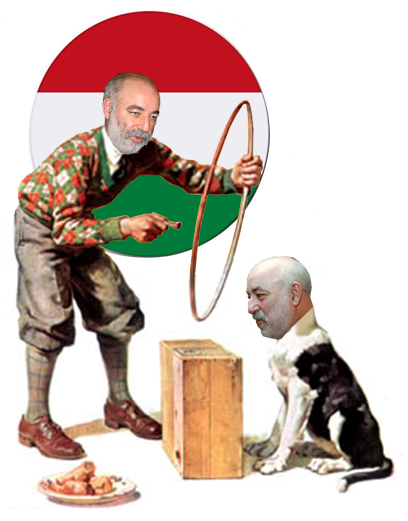 Vekselberg is also the owner of Diamond Air Sarl, the Luxemburg cut-out which bought the property from the Hungarians, apparently in advance of a competitive tender the Hungarian government conducted for the purpose of realizing the best price for its asset. and the Hungarians apparently got a steal — I mean, a premium. As chairman of the board of directors of Hong Kong-listed United Company Rusal, Vekselberg must be a fit and proper person, according to the rules of the Securities and Futures Ordinance (Hong Kong), and not a simply a clever one. That he has been accused in the courts of the US and Switzerland in the past is well-known; that he has been exonerated in Switzerland, and avoided jurisdiction in the US is also well-known. What the three accused Hungarians may have to say in their defence remains to be heard, if indeed suspicion in their cases materializes into indictments and trials. For the time being, Vekselberg’s spokesman Andrei Shtorkh is not feeling the need to make a response to published innuendoes that Vekselberg may have been anything more than clever in this affair. There is no barking from the government officials either. That may be a clue to the trick.